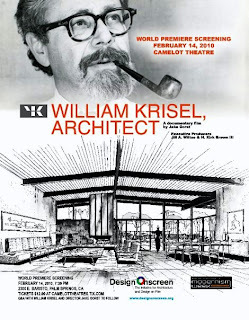 Poster art for "William Krisel, Architect"
William Krisel, Architect trailer from Design Onscreen on Vimeo. The long-awaited documentary on the life of architect William Krisel (see above trailer) will be premiering on February 14th at the Camelot Theater during Modernism Week in, most appropriately, the community that bears his stamp more than any other architect, Palm Springs. (see http://www.modernismweek.com/ for schedule of events). I was privileged to be part of the film by providing: research assistance, interview candidates and questions, building location scouting, hi-res scans of stills used in the film including material from my private collection, and interview of myself by film maker Jake Gorst. http://www.imdb.com/name/nm3735029/. Film maker Jake Gorst at work. Location scouting by John Crosse, Airport-Marina Towers, 1971, William Krisel. Photo by John Crosse. Jake Gorst and I had the distinct honor of being the last people to interview Julius Shulman on film before his passing last July (see below). 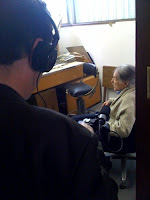 Film maker Jake Gorst filming me interviewing Julius Shulman in his studio. Photo by Phil Weyland. It's hard to believe, but even though Krisel is responsible for thousands of dwellings in Palm Springs, he was so prolific a designer that his desert work constitutes only 5 % of his total production. 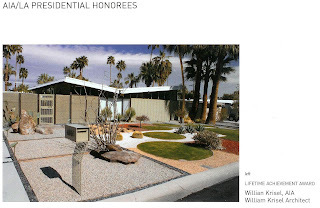 For more on Krisel's Palm Springs work see http://www.psmodcom.com/Architects%20Pages/PalmerKrisel/PalmerKrisel8.html. Chris Menrad House, Twin Palms, Palm Springs, William Krisel, Architect. Photo by John Crosse. Krisel was honored with a lifetime achievement award at the AIA-LA Design Awards Party at the Egyptian Theater on Oct. 21st. The above photo announcing same was published in January/February 2010 issue of "Form: Pioneering Design." Krisel also had an exhibition of his work at the MODAA Gallery in the Studio Pali Fekete, Architects Building in Culver City last November. (see below). Krisel's archives were recently acquired by the Getty Research Institute where they will reside in the pantheon of Southern California Mid-Century Modernism alongside those of Julius Shulman, John Lautner, Pierre Koenig, Ray Kappe and others. The archives couldn't have found a better home. The Getty Research Institute is fast becoming a most important one-stop location for the in-depth study of the region's unique brand of modern architecture studied and emulated by architect's and researchers around the world. Krisel commissioned me to organize his papers and drawings in anticipation of the Getty's acquisition. My summary of the archive's contents can be found at the link below. See also the Getty Research Institute link under my Links of Interest to the right.